the entire logistics chain, EndChain is believed to have potential to become the blockchain solution that this industry desperately needs. In this article, let’s see which factors make EndChain become such a potential product that is easy to use for all verticals of the supply chain. The combination of a barcode and QR code has multiple advantages, but there are two major ones. Nowadays, each product can have a barcode and 2–3 QR codes attached. With just one combination code, EndChain can help to reduce the confusion among providers. Instead of wasting time choosing the right code for each items, workers will know exactly where to scan. Besides, the second benefit .is the code will update both the blockchain and legacy system at the same time. Once people use their EndChain program to read the code, it will update the blockchain as well as legacy programs. The software will automatically update the chain with the new data that can be seen by all users. If the logistics industry is more transparent, both consumers and producers will earn more benefit. While consumers are able to know whether the item they are paying for is as described or not, manufactures can reduce their lost sales due to counterfeits. Using EndChain, manufactures can reduce or even eliminate two of the biggest threats: supply chain mismanagement and counterfeits. With their special patent –pending code, EndChain can protect both consumers and producers. All goods will be scanned with its individual chain identifier at manufacturing point and then be tracked until the last destination. 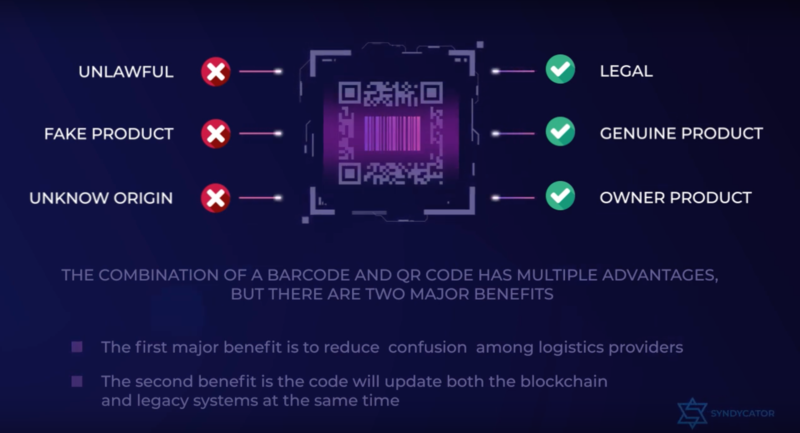 Once the product has reached the store, the employees just need to scan the code and the system will automatically differentiate and recognize if the code belongs to EndChain. Moreover, in case consumers want to resell their items, it will be very easy to verify if they are authentic products or not. By scanning the QR code on the product, EndChain will shows buyers whether the item is counterfeit of not. Normally, to get information on the location and status of products, supply chain participants have to get information from multiple systems. It not only takes them a lot of time but also results in poor managed inventory levels. With such a cheap and automated system like EndChain, supply chain players will reduce human error and other related cost inefficiencies. EndChain’s team has created an attractive and price competitive solution for logistic industry. Overall, it can be seen that this project has many potentials to be successful. While other competitors focus on high — end goods, EndChain pays more attention to the low to middle market, an area that has been ignored for too long. In the present context, EndChain is a very promising solution for logistics industry. With its multiple functions and affordable price, it will be a competitive product as well as able to create a lot values for their users and investors.